Ever since the New Nintendo 3DS XL was released here in North America, fans have been asking Nintendo to release the more compact New Nintendo 3DS with face plates. 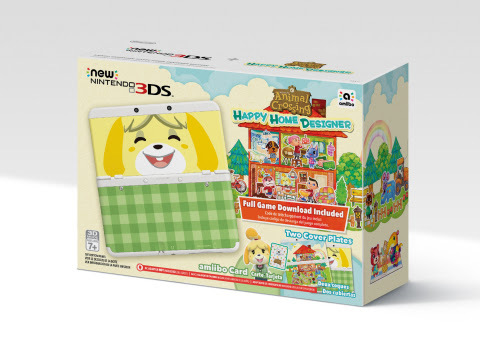 Those dreams have come true, as today Nintendo announced a New Nintendo 3DS Animal Crossing: Happy Home Designer bundle. This bundle includes the new more compact New Nintendo 3DS, Animal Crossing: Happy Home Designer game, two cover plates, and one amiibo card. You will be available to purchase this bundle come September 25th. A tweet from Nintendo of Canada confirmed that this bundle will be released here in Canada, however the pricing has yet to be revealed. The new bundle will be available in the US for a retail price of $219.99 . With the holiday season just around the corner, this September is a perfect to pick this up for the Animal Crossing, and Nintendo lover in your family.